Denise grew up in Minnesota and her love of gems and rocks started in the 7th grade when she took a field trip to the limestone caves along the Mississippi River. Reading about rocks, gems and fossils in class, her tom-boyish instincts took over on the field trip that day. She scavenged through rocks and dirt hoping to find a small treasure. No rock went unturned that day and her efforts paid off. She found a several million year old trilobite fossil. From that day she spent much of her childhood collecting rocks, fossils and gems not knowing one day she’d have her own jewelry store. In November of 2000, Denise opened her first store in Montana. Her passion for gems led her to attend the Gemological Institute of America, where she gained the formal knowledge of the rocks and gems from her youth. A few short years later in 2008 and again in 2016 and 2017, she was honored to make the “Top 50 Jewelry Retailer” list, a prestigious award from the jewelry industry itself. Her little store was among some of the most well known and extravagant stores in the U.S. “I was in awe and disbelief at first, I thought someone had made a mistake but soon after I realized it was true. I just like to treat people well and do honest business. My beliefs were based on what God had expected of me. It's a long journey with God but over time he teaches you how to live an honorable life, laugh at yourself and how to love with your whole heart. 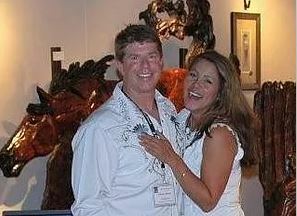 This journey was just beginning and my life improved dramatically when I met my best friend and now husband at an art show in Las Vegas”. "Needless to say I moved to Oregon and well here we are." "I'm so lucky to be married to my best friend and talented artist." Michael didn't start out as an artist but discovered his talent in the late 80's. As a gifted sculptor, his work was featured in Cabela's early on in his art career and has developed an amazing list of Accolades and collectors. His newest creation is wooden sunglasses made from music grade wood, meaning that the wood that he uses is typically used for musical instruments. Stop by the store and see his amazing sculptures and beautiful wooden sunglasses. He is truly a gifted artist! Since opening our doors, we are so over joyed with the response that we have received from the Sunriver locals and patrons from the great Northwest. Thank you Sunriver!